Drip Cakes are super popular, and with good reason. They look great, you can customize the colors and create a stunning masterpiece. Follow the video below and you will learn how to make a drip cake so beautiful, everyone will think you bought it! Before getting started, you will need a prepared cake ready to ice. Once you have that, just follow the steps below. To get started, you first need to ice the cake with buttercream and smooth it out. You can buy smoothing tools here. This is going to be your base color and can be whatever color you like. In the video, white is used which is always a great base to start from. Use a pastry bag to pipe a messy line of color around the bottom of the cake. You can then add another color, or the same color in a different shade. Feel free to experiment here as there is an unlimited number of color effects you could create. Smooth the cake again while dragging the colors along. If you’ve used more than one color, they will blend in together. Prepare some ganache to ‘drip’ over the cake. You can do this with Candy Melts, but once they set, the cake will be difficult to cut into. Another option is to use a mixture of white chocolate ganache, candy melts, and gel color. To make the ganache, combine equal parts white chocolate melts and heavy cream. Microwave the mixture until the chocolate just melts. Keep a close eye on it and check every 30 seconds or so. Once the ganache is prepared, add a small amount of candy melts (if using). Lastly, add gel or oil based color to achieve the right hue. Make sure it is one that works well with chocolate. Time to pour the ganache over the cake. This is a dripping effect, so you don’t want to cover the whole cake. Use a squeeze bottle so you can control the flow of ganache and take your time. To finish add some decoration on top. You can use whatever cake topper you like here. If you are creating the cake for a themed party, use themed toppers. Other suggestions include candy pieces, lollipops, meringues, macaroons or even fresh flowers. Check out the Drip Cake video below from Craftsy. 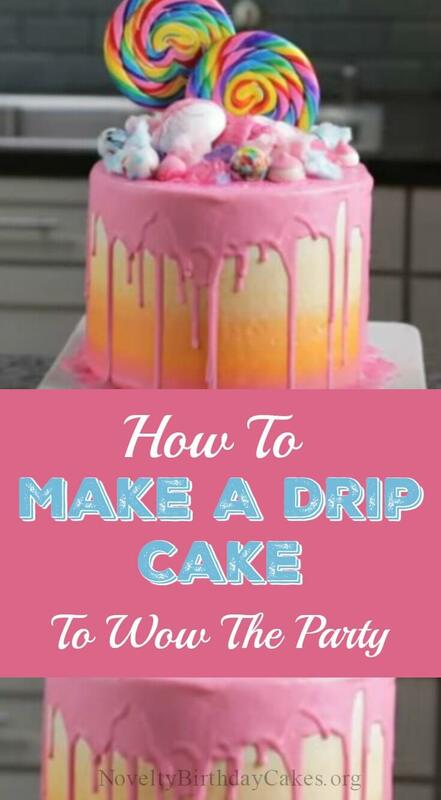 Follow these steps on how to make a drip cake and you will be wowing your guests in no time. Have fun and enjoy experimenting with colors and themes.